The history of the automobile involved many dedicated inventors. 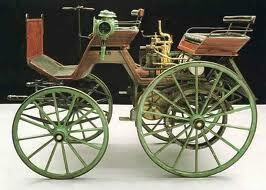 The first real automobile, a self-powered steam vehicle, was built by Amedee Bollee in 1873. In the next step toward the automobile, Nikolaus Otto invented a four-stroke petrol gasoline internal combustion engine, the most common method of automotive propulsion. The four-stroke diesel engine was invented by Rudolf Diesel. Then, Etienne Lenoir patented the first practical gas engine in Paris. The first carriage-sized automobile in the United States was a steam-powered vehicle invented in 1871 by Dr. J.W. Carhart. By 1891 the Daimler Motor Company, owned by Steinway (the piano family), produced petrol engines for tramway cars, carriages, quadricycles, fire engines and boats in a plant in Hartford, CT. In 1893 Charles and Frank Duryea, built the first gasoline powered car in America. Two years later, they opened America’s first motor manufacturing company.